Lawrence Evans Chapman Jr., M.D. L. E. “Larry” Chapman, Jr. was born in Galveston, Texas on February 23, 1924 to L. E. Chapman, M.D. and Cecilia Sedgwick Chapman. 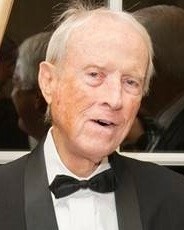 Larry attended Ball High and later graduated from Rice University with a degree in Civil Engineering in 1948. Larry served in WWII in the Army Air Corps and was selected during his sophomore year at Rice to attend the acclaimed Meteorology program for the Army Air Corps. He would later be stationed in the South Pacific as a weatherman monitoring hurricanes. Larry would later return to Rice to complete his Engineering degree and was a member of Tau Beta Pi. Dr. Chapman attended medical school at The University of Texas Medical Branch in Galveston where he graduated in 1955. Dr. Chapman served his internship at Detroit General Hospital. Following his internship he served a year of surgery residency at the V.A. Hospital in Dallas. It was in Dallas that Dr. Chapman met and married Marilyn Jones on March 2, 1957. Dr. Chapman is survived by his loving wife Marilyn, his two children: L.E. “Chap” Chapman III (Janet Greene) and Nancy (James Wallace) and three grandchildren: Emily, Katherine, and Jackson. He is preceded in death by his parents and his daughter, Mary Anne. Dr. Chapman established his family medical practice in Seabrook in 1962, after previously practicing in Angleton and Madisonville, Texas. Dr. Chapman was one of the first attending physicians to the Johnson Space Center employees and the Astronauts’ families. He partnered with Dr. Arthur Anton to form the Chapman Anton Clinic in Seabrook. Their friendship and association would remain through each of their retirements. For almost 50 years, Dr. Chapman provided medical care to citizens of the Bay Area Community at his office, hospitals, nursing homes and the homes of his patients. Yes, Dr. Chapman even made house calls on his bicycle. In addition to being a great doctor to all his patients, Dr. Chapman was keen on the evolving medical needs in the Space Center community. In 1972, he and his brother-in-law, T. F. “Frank” Glass, Jr., developed the first hospital in the Clear Lake Area. Dr. Chapman and a group of doctors, known as the Founders Group, developed the Clear Lake Hospital complex. Dr. Chapman would serve as the first Chief of Staff. Later he and a number of other doctors would partner with the Sisters of Charity to found St. John Hospital in Nassau Bay. In 1985 Dr. Chapman and others started an informal committee to create mental health counseling services to people in the area. In 1985, a non-profit was launched, known as The Samaritan Center of the Bay Area. Later as a Founding Board Member the non-profit would become known as the Carol and Ronald Krist Samaritan Center. Dr. Chapman also served on the Board of Missions of St. Thomas the Apostle Episcopal Church in Nassau Bay. Larry was a beloved husband, father, and friend. He was fair, kind, generous, gregarious, fun, sentimental, caring, and loyal to a fault. He treasured his friendships and family above all else. Despite his busy schedule, he always had time for them. The outpouring of love that his family has received from those that knew Larry has been overwhelming and greatly appreciated. He will be deeply and forever missed. Friends are invited to a celebration of life with the family from five until seven o’clock on Thursday, December 6, 2018 at Bradshaw-carter Memorial & Funeral Services, 1734 West Alabama Street in Houston. A memorial service will take place at two o’clock in the afternoon on December 26, 2018 at Trinity Episcopal Church, 1015 Holman, in Houston. In lieu of flowers, memorial contributions may be directed to Preservation Houston, 3272 Westheimer Road, #2, Houston, Texas 77098; Houston SPCA 7007 Old Katy Road, Houston, Texas 77024, or the charity of one’s choice.